When clinicians measure salivary cortisol and DHEA (DHEA-S) to assess stress and HPA axis function, it is common to find DHEA levels below the reference range in a number of individuals. A common explanation for the depletion of DHEA and other hormones (e.g., progesterone, testosterone) due to chronic stress is the phenomenon known as “pregnenolone steal.” This notion basically states that since all steroid hormones use pregnenolone (derived from cholesterol) as a precursor, the elevated secretion of cortisol caused by acute or chronic stress will inevitably result in less available pregnenolone to serve as a precursor for the production of DHEA and other down-stream hormones. In other words, according to this theory, the need for cortisol synthesis “steals” pregnenolone away from other hormone pathways, reducing the potential synthesis and secretion of other necessary hormones, resulting in some of the pathophysiological changes related to stress. While a rise in cortisol levels and a concomitant drop in DHEA is one of the clinical characteristics of early and mid-stage chronic stress progression, this phenomenon is not caused by diminished adrenal pregnenolone availability or “pregnenolone steal.” The most obvious reason is the fact that the conversion of cholesterol to pregnenolone occurs in the mitochondria of each respective adrenal cortex cell type that is responsible for producing these hormones. Simply put, there is no known adrenal pool of pregnenolone for one cell to steal away from another, and no known mechanism has been described that could facilitate the transfer of pregnenolone between the mitochondria of different cells (in this case, from the mitochondria of cells within the zona reticularis to those within the zona fasciculata). Unfortunately, the most common figures used to teach steroidogenesis show a common pathway and typically do not specify the differential regulation of available enzymes between different steroidogenic tissues. This leads many to incorrectly assume there is a single “pool” of pregnenolone available for all steroid hormone synthesis within the adrenal. A much better way to teach this is to show the different enzymes available to each cell within the adrenal cortex, showing that each is capable of converting cholesterol to pregnenolone; then to the various needed hormones. This is a figure from the new book- that shows a better way to teach this that avoids showing a single “pool” of pregnenolone for all down-stream hormones. 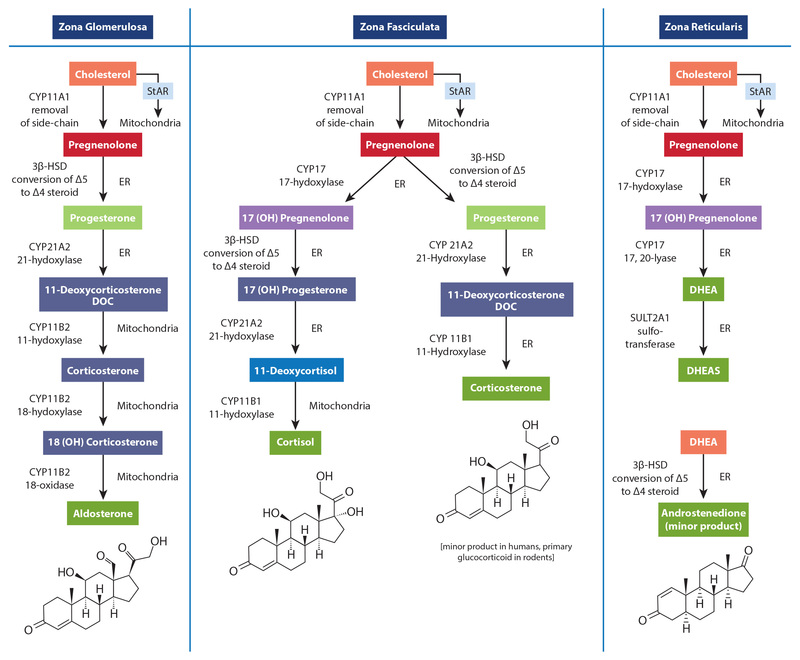 In addition, while the ACTH-driven adrenal synthesis of cortisol is orders of magnitude higher than that of DHEA, and fluctuates radically within a 24-hour period, the overall synthesis of DHEA and DHEA-S is 500-1000 higher than that of cortisol. Therefore, even if cortisol and DHEA production shared a common pool of pregnenolone (which they do not), the amount of pregnenolone used for cortisol production (even when elevated) would have very little effect on the production of DHEA(S). Finally, as decades of steroidogenesis research has shown, the control of adrenal hormone output is regulated mostly by cell-specific enzyme concentrations and external signals coming from outside the adrenal gland (See our latest book for specifics). What, then, does this mean in relation to cortisol and DHEA output which, when measured, appears to confirm this phenomenon? What about the role of oral pregnenolone therapy for supporting adrenal DHEA production? Well, it’s a bit complicated. While HPA axis stress and subsequent cortisol synthesis and secretion may be related to the acceleration of reduced DHEA production (i.e., a stress-induced down-regulation of DHEA), this relationship is facilitated by regulatory processes (e.g., feedback inhibitions, receptor signaling, genomic regulation of enzymes, etc. ), not an intra-adrenal depletion of pregnenolone as a precursor to downstream hormones. For instance, experimentally-induced hyperglycemia and hyperinsulinemia has been shown to affect DHEA and androstenedione production in human subjects., In one study of poorly-controlled type 2 diabetic subjects with elevated cortisol and low DHEA levels, the enzyme necessary for DHEA formation in the zona reticularis (17,20 lyase) was shown to limit the production of DHEA. The enzyme activity was corrected (along with near normalization of cortisol, DHEA and DHEA-S levels) after six months of diet or pharmacotherapy to improve blood glucose control. Additionally, cell-culture studies suggest that under inflammatory stress (IL-4 and other cytokines), the zona reticularis will down-regulate DHEA production when ACTH is present.,These and many other factors (e.g., aging) are likely the driving influences affecting the dynamic relationship between cortisol (activated by the HPA axis) and measured DHEA and/or DHEA-S levels. By re-assessing the specific mechanisms that drive the stress-related changes in adrenal hormone output, and moving away from older and incorrect explanations, we are able to seek (and perhaps address) the various signals that are actually responsible for modulating adrenal hormone secretion during the progression of chronic stress. If you are interested in learning more about this subject and how oral pregnenolone and DHEA may improve outcomes in subjects with stress-related dysfunctions, please consider getting our newest book: The Role of Stress and the HPA Axis in Chronic Disease Management. Boudou P, Sobngwi E, Ibrahim F et al. Hyperglycaemia acutely decreases circulating dehydroepiandrosterone levels in healthy men. Clin Endocrinol (Oxf). 2006 Jan;64(1):46-52. Vásárhelyi B, Bencsik P, Treszl A, et al. The effect of physiologic hyperinsulinemia during an oral glucose tolerance test on the levels of dehydroepiandrosterone (DHEA) and its sulfate (DHEAS) in healthy young adults born with low and with normal birth weight. Endocr J. 2003 Dec;50(6):689-95. Ueshiba H, Shimizu Y, Hiroi N et al. Decreased steroidogenic enzyme 17,20-lyase and increased 17-hydroxylase activities in type 2 diabetes mellitus. Eur J Endocrinol. 2002 Mar;146(3):375-80.